A photograph of the Milam School, a one-room schoolhouse near Hallowell, Kansas. Kneeling, left to right: Dale Coble, Clark Zahm, and Paul Coble. Front row, left to right: Erleen Richardson, Kathleen Richardson, unknown, unknown, Ernie Draeger, unknown, Aleen Richardson, Patsy Coble. 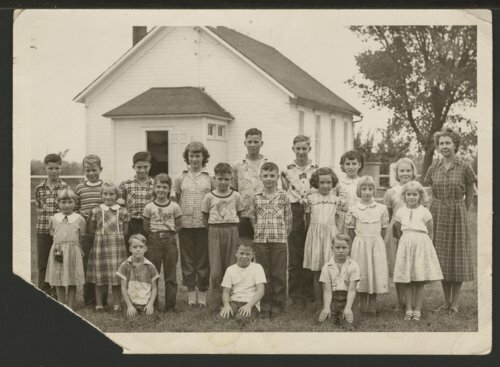 Back row, left to right: unknown, John Zahm, unknown, Judy Zahm, unknown, David Coble, unknown, Pauline Richardson, and teacher Ethel Hutchens.